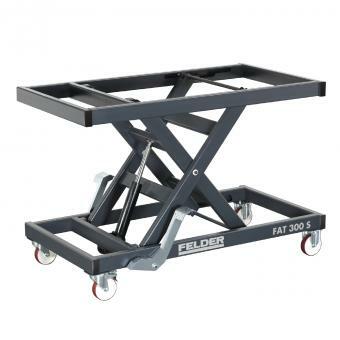 Machinery equipment vehicle, storage assistance, stacking cart or additional workspace - the Felder level lifting table FAT 300 S is versatile and offers maximum stability and simple mobility at all times. With the solid frame moving on robust wheels, the easy to use foot pump hydraulics and the extremely durable working surface, stability, manoeuvrability and a comfortable working height are always guaranteed. !! without worktop surface ! !